Previously, we introduced the contact force, which described any physical contact between an agent and object as having an arbitrary magnitude and direction. In the next few videos, we are going to create a better and more sophisticated model of the contact force. It starts with the normal force. In this model, we need to assume that either the agent or the object have a flat surface at the point of contact. In that case, we can define the normal force. The magnitude of the normal force is still arbitrary. It can be anything, depending on the strength of the contact. The direction of the normal force is perpendicular to the contact surface pointing from the agent to the object. It is a pushing force, only. The magnitude of the kinetic frictional force is proportional to the magnitude of the normal force. The constant of proportionality is called the coefficient of kinetic friction and will be different for every situation. The direction of the kinetic frictional force is in the opposite direction of the velocity of the object relative to the agent. Remember, while it is useful to call the two components normal force and frictional force, they are not separate forces. They are components of the same contact force from a single agent. There will be a set of them for each contact force in the problem, and each belongs to its own set. The magnitude of the static frictional force is the product of the magnitude of the normal force times the coefficient of static friction. The direction of the static frictional force is in the opposite direction of the velocity the object would have relative to the agent if there was no friction. Notice one big difference between this and the definition for kinetic friction. The coefficient for static friction is not a constant. It can vary between zero and some maximum value that is different for every problem. A coefficient of static friction is defined by the maximum value it can have. Like before, the normal force and the frictional force are not separate forces. They are components of the same contact force from a single agent. 1. 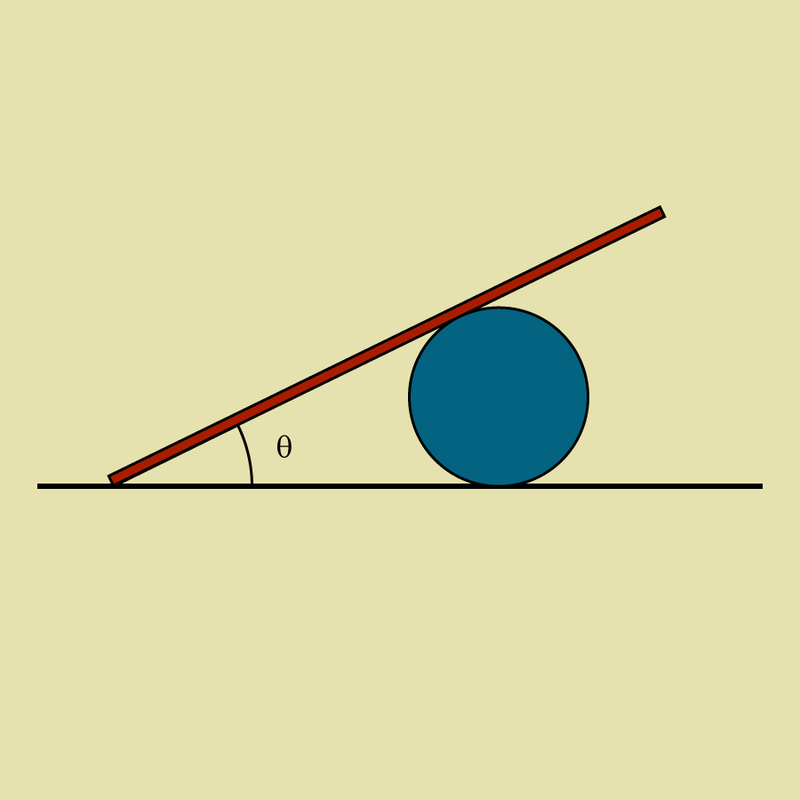 A stick leans against a ball an angle theta above the horizontal as shown in the figure. Nothing is moving. What is the free body diagram for the ball? 2. Two blocks are moving as seen in the figure. The coefficient of static friction between the blocks is \(\mu_s\). What is the minimum speed block A must go such that block B doesn't fall? What is the minimum acceleration block A must go such that block B doesn't fall? 3. Alice is pushing with a force of magnitude \(P\) horizontally (to the ground) on a block that is sliding up an incline making an angle \(\theta\) relative to the horizontal. The coefficient of kinetic friction between the block and the surface is \(\mu\). What is the acceleration of the block? 1. A stick leans against a ball an angle theta above the horizontal as shown in the figure. Nothing is moving. What is the free body diagram for the stick? 2. Alice is pulling on a crate of mass, \(m\) with tension force, \(T\) an angle \(\theta\) above the horizontal, and Bob is pushing on the crate with pushing force, \(P\) an angle \(\phi\) below the horizontal. 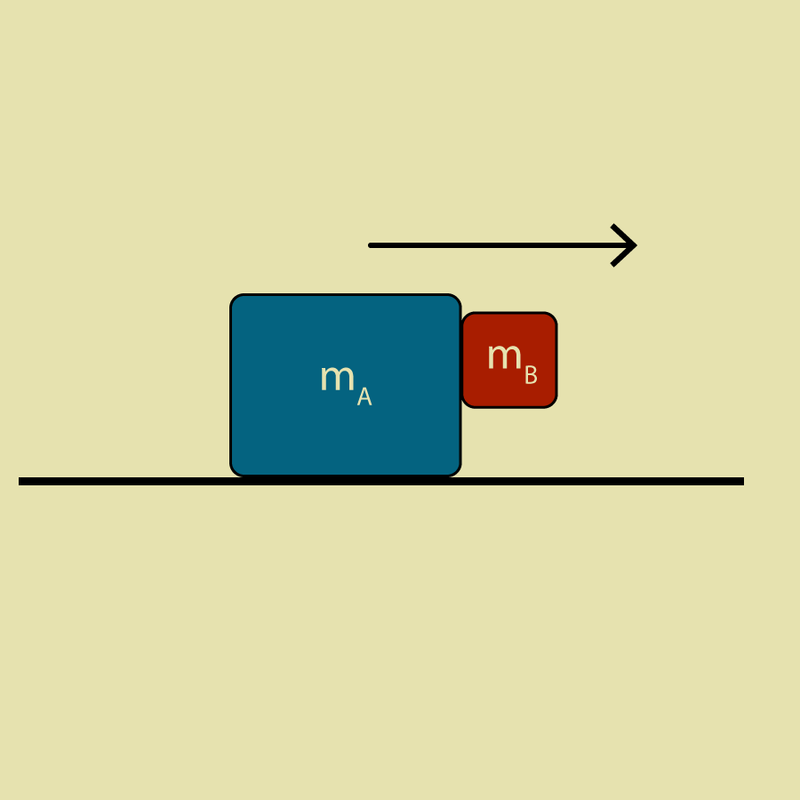 The coefficient of kinetic friction between the crate and the ground is \(\mu\). What is the acceleration of the crate? Is there a maximum angle of \(\phi\) where Bob is no longer helping? 3. A book is placed against a wall. A force is acting on the book, pushing it against the wall. The force is angled up, at an angle \(\theta\) with respect to the vertical. The coefficient of static friction between the book and the wall is \(\mu\). What range must the magnitude of the force have such that the book doesn't move? Find a relationship between \(\theta\) and \(\mu\) such that there is no magnitude large enough to make the book slide up.